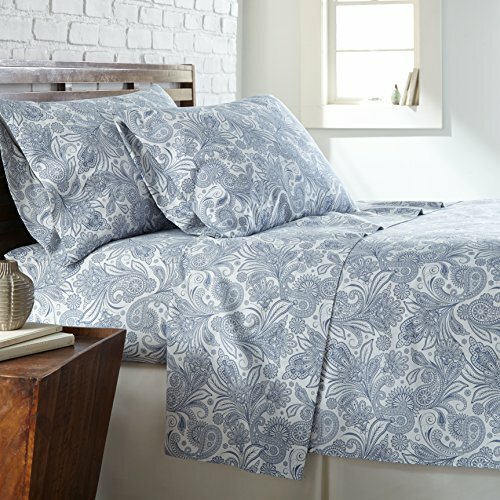 Silence your mind and embrace your inner calmness with our Perfect Paisley sheet set. Our global henna inspired paisley print combined with the sweet gentle tones of blue, coral, and taupe will make your bedroom the most sacred place in your home. Backed by Southshore Fine Linens One Year Warranty, these sheets are part of our 110 GSM Microfiber Perfect Paisley Boho Collection. Made with high strength microfiber yarns, our sheets are long lasting, shrinkage-free, Fade Resistant and provide silky soft finish. These sheets were brushed twice on one side and once on the other side. This unique manufacturing process makes them one of the softest sheets on the market. These sheets have true 15-inch-deep pockets and will easily fit on mattresses up to 15 inches deep. Made under our trademarked Brand SouthShore Fine Linens, a lot of attention has been paid to every aspect of the product. Starting from fabric feel, to stitching and even custom packaging. Buy directly from Southshore Fine Linens and our Amazon FBA account for the One Year Warranty. We do not have any other authorized dealers on Amazon. Sizes: Twin: One flat sheet: 66 in wide x 96 in long, One fitted sheet: 39 in x 75 in x 15 in deep and One pillowcase: 20 inches wide x 30 inches long. Full: One flat sheet: 80 in wide x 94 in long, One fitted sheet: 54 in x 75 in x 15 in deep and Two pillowcases: 20 inches wide x 30 inches long. Queen: One flat sheet: 90 inches wide x 102 inches long, One fitted sheet: 60 in x 80 in x 15 in deep and Two pillowcases: 20 inches wide x 30 inches long. King: One flat sheet: 106 inches wide x 102 inches long, One fitted sheet: 78 in x 80 in x 15 in deep and Two pillowcases: 20 inches wide x 40 inches long. California King: One flat sheet: 106 inches wide x 102 inches long, One fitted sheet: 72 in x 84 in x 15 in deep and Two pillowcases: 20 inches wide x 40 inches long. Easy Care: Machine Wash Cold, Tumble Dry. Do not use Bleach. Twin Size Sheet Set is a 3-Piece Set includes One Flat Sheet: 66 in wide x 96 in long; One Fitted Sheet: 39 in x 75 in x 15 in deep. ONE Pillow Case: 20 in x 30 in. Bohemian, Eclectic, Classic, Paisley Theme, made with 110 GSM (Grams per square meter) signature Microfiber Vilano Fabric. Guaranteed to fit 15 inch deep Mattresses easily. These sheets will easily fit mattresses up to 15 inches deep. We guarantee a comfortable fit on Mattresses up to 15 inches deep WITHOUT the corners pulling out. Guaranteed! Fitted Sheets have elastic all around. PREMIUM QUALITY - These sheets are part of our Signature 110 GSM Series - They are double-brushed during the manufacturing process for extra softness. These sheets are made with 110 GSM Microfiber Sheet Sets. This product will not Fade in color or Shrink after washing. Comes in Twin, Full, Queen, King, and California King Sizes. EASY CARE - Machine wash in cold. Tumble dry low. Remove Promptly. High-quality double-brushed microfiber makes this sheet set extra soft and comfortable crawling into bed has never been easier and getting out of bed so hard. If you have any questions about this product by Southshore Fine Living, Inc., contact us by completing and submitting the form below. If you are looking for a specif part number, please include it with your message.